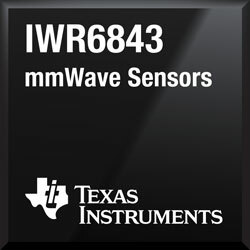 To advance millimetre-wave (mmWave) sensor technology in worldwide industrial applications, Texas Instruments has released its 6GHz sensor portfolio, the highest resolution single-chip, CMOS, for industrial systems. The IWR6x mmWave sensors allow industrial automation through on-chip processing capabilities, offering real-time decision-making and signal processing. The newest 60GHz mmWave sensors will be the first to include antenna-on-package offerings, which eliminate traditional challenges associated with RF design while shrinking size up to 75% and reducing overall cost. With 60GHz mmWave sensors, engineers globally can integrate the technology into a wide range of robotics, factory automation and building automation designs while leveraging the ISM band for broad deployment. Created for industrial performance, these high-resolution sensors provide up to 4GHz of ultra-wide bandwidth to detect objects and motion up to 16 times more accurately than 24GHz narrowband solutions.